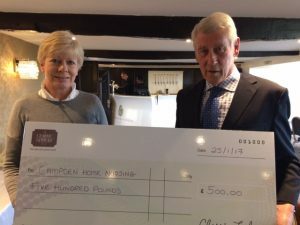 Charingworth Manor raised the wonderful sum of £500 for Campden Home Nursing from the proceeds of their 2016 photography competition. The 12 best photographs were featured in a beautiful calendar and the proceeds were presented to Pippa Knight, Nurse Manager of Campden Home Nursing. General Manager, Michael Eastick presented the cheque during a lovely evening event and we cannot thank Charingworth Manor and their team enough. We look forward to working with them again in the future.